Sarah Frank (Warm Springs/Umatilla/Yakama/Nez Peirce) is a certified prevention specialist for Warm Springs Health and Human Services. Last year, Sarah helped organize the ‘Recovery Never Ends’ Conference to help educate those in recovery through talking circles and healing activities. She also spoke at the first suicide prevention seminar in Oregon and recently attended our Survivors of Homicide Facilitator training. Sarah also helps coordinate several groups for her community in Warm Springs, OR, including meetings on Wellbriety, Celebrating Families, Warriors Accepting Recovery, and Drug Endangered Children. 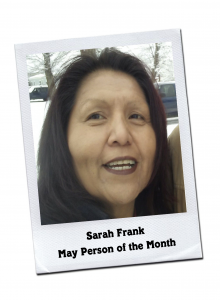 In her community, Sarah focuses on issues related to sobriety and recovery, sexual abuse, traditional family values and Native American culture. Sarah is a strong supporter of the Wellbriety Movement and has greatly served her community! New Directions for Women is a 30-bed residential rehab facility located in Southern California’s Costa Mesa. Since 1977, New Directions for Women has transformed countless lives by offering affordable and accessible rehabilitation treatment services for women suffering from alcoholism, substance abuse and other chemical dependency problems. New Directions for Women believes that designing and implementing successful intervention strategies to help women with substance use disorders requires and understanding of the racial, ethnic, cultural, gender, and co-occurring stressors for women with children. Therefore New Directions for Women places an emphasis on excellence, spirituality, integrity and diversity in all aspects of their organization. Women of all ages, including those who are pregnant or have children, heal emotionally, physically and spiritually through the many services available to patients. As a women’s only addiction treatment program, New Directions for Women provides gender separate, culturally relevant and holistic treatment services that meet the special needs for women, women with children and their families. Some of the programs include: yoga, psychodrama, physical exercise, art, gardening and varieties of experiential therapy. 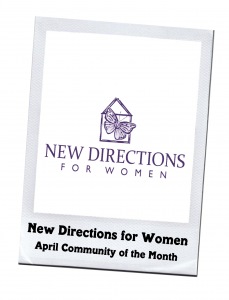 New Directions for Women understands that women with addictions come from many backgrounds. As a result, they choose to provide therapeutic services that are inclusive of various cultures and expose women and children to new ways of thinking and experiencing. In fact, New Directions for Women has had several of their staff members trained by White Bison and is proud to offer a Wellbriety group on their campus.